Neem Leaf has been used internally for thousands of years to nourish and support the skin and immune systems. 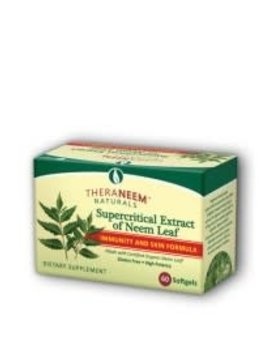 TheraNeem uses Supercritical Extraction to offer a highly-concentrated (50:1) extract of Organic Neem Leaf in a tiny, easy to swallow gelatin capsule. Supercritical Extraction uses natural carbon dioxide to create a pure, powerful extract with no harmful solvent residue. Contains: Azadirachta indica (Neem) Leaf SCO2 Extract (50:1) (50% liminoids) 8mg per serving. WARNING: Do not use if you are pregnant, breastfeeding or if you are trying to conceive a child (men & women).